Home › Lawyer SEO › Is WordPress the Best Website for Personal Injury Lawyers? Is WordPress the Best Website for Personal Injury Lawyers? Yes! Without any hesitation, yes! Over the last three years dozens have lawyers have inquired about my services which include helping law firms rank better in Google search. The first question I ask is, “Do you have a website?” The second question I ask, “Is it WordPress?” If a potential client does not use WordPress I am very reluctant to work with them simply because it will be such a challenge to produce new content through a different web portal or dashboard. As I tell all of my clients, WordPress is easier than using email. WordPress has everything a law firm will need to rank in Google search. When it comes to personal injury lawyer SEO the most important factor is quality content that is updated on a consistent basis. If you want to rank for highly competitive keywords it often takes a blog post a day or multiple blog posts a day. This is in addition to updating “money” pages or areas of practice pages. If you are unwilling to make this commitment you will notice you are treading water when it comes to your Google search rankings. Just last month Google completed a Core algorithm update in which news websites saw a huge jump. 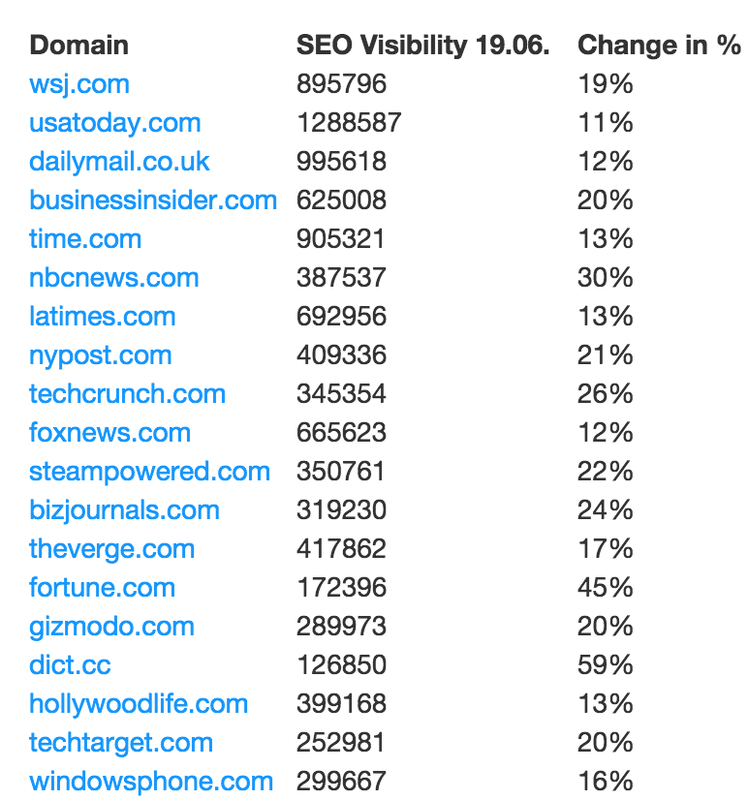 Below you will find a chart of the websites that saw the largest increase in Google search visibility. News websites are seeing a jump because they produce content throughout the day. It isn’t the fact that they are news websites, it is the fact that multiple new pages are published live during every hour of every business day. As a law firm I recognize you do not have the ability to do this; nor should you try. That said, I would suggest publishing as many new pieces of information on your website as possible. If you need help with this feel free to reach out to me at jwojdylo@gmail.com as I have several monthly packages for both content and SEO that can help you rank better in Google search. If you have a paralegal or content writer for your website you can assign them a role of author or editor. This means they can write and publish their own posts but you don’t have to worry about them messing up your areas of practice pages or other important parts of your legal website. If you trust your SEO team or your “Internet guy” you can give them access as an administrator and you don’t have to worry about anything. You can simply watch from afar as your website is uploaded with content every single day. Google Search Console, the old Google Webmaster Tools, has a tab to look at content keywords. Not too long ago I wrote an article stating that I feel the Content Keywords number in the Google Search Console is one of the most important factors in search rankings. This tab will tell you how many times a specific word is used on your website. In essence, this is how Google determines your expertise. If you have a legal website and the most used word is Nike do you think you are going to rank for car accident lawyer keywords? In my article I predicted that a word needed to be used, at least, 1000 times on a website for that particular domain to rank for said keyword. Today, I think that number is even higher. My guess is it is closer to 2500 or 5000. The only way specific keywords are going to be mentioned on a website is with more blog posts or articles. The personal injury keywords must be natural so it will take quite a few updated pieces of content to reach a threshold of ranking for competitive phrases. Note that law firms in smaller cities will likely not need to reach the 2500 or 5000 mark in terms of appearances of a keyword. They will likely only need 500 to 1000 since there is such little competition. No matter what keyword you are looking to rank for remember that Google needs to know these phrases therefore they need to be mentioned, naturally, many times on your website. WordPress easily allows you to update old content and submit new blog posts with a few clicks of the mouse. If you can send an email you can create a blog post through WordPress. This is why every law firm or law office in the United States needs a WordPress website today. If you are a personal injury lawyer or attorney looking to rank for premises liability, car accidents, truck accidents or medical malpractice I strongly urge you to get a WordPress website and increase the amount of content you publish. The more content you publish the more likely it is that major news organizations and other legal websites will link to your page. Natural links and quality content is the best way to improve search rankings. If you need assistance with this reach out to me any time at jwojdylo@gmail.com. Snapchat User Profile: alexisklein14 | Why Are Reddit Users Upset and Leaving for Alternative Voat.co?